Home Blogging How to Back-Up Your WordPress Site Automatically? It is sensible to be proactive and take a back-up of your WordPress site in order to be prepared for the worst. Though it doesn’t happen often, but when it does, it feels better if we are prepared for any such incident. So, it only makes sense to have a back-up copy of your own website or blog. Majority of the web hosting companies offer some sort of back-up plans. But, irrespective of whether your hosting site offers a back-up facility of not, you are required to create continuous back-up of your own data which is no doubt precious. So, how to create the back-up of your own website or WordPress blog automatically and don’t have to learn the lesson the hard way?! Here are a few simple tips that I am sure you will find quite useful. Just have a look at them! It is very obvious that most of the data in your WordPress site is saved in a database on the server of your host including the site settings, posts, pages, comments, and settings for themes, your installed plug-ins, etc. But it does not store your core files, plug-in files and images, etc. for which you need separate to create a back-up. You can use one of the more popular plug-in to create back-up of your important data. One important thing is that don’t rely upon your memory which might fail you occasionally. So, it is sensible to create an automatic back-up. Create schedules to take back-up and also send a copy of the back-up to your email account to avoid any troubles in future. You can use WP-DB Manager which is quite useful for our purpose. Just go to your WordPress control panel, choose plug-ins and click on add new. By selecting and clicking upon the installation link, you can easily activate it. After successfully installing the plug-in, look for a new module situated at the bottom of the control panel on the “Database” tab. 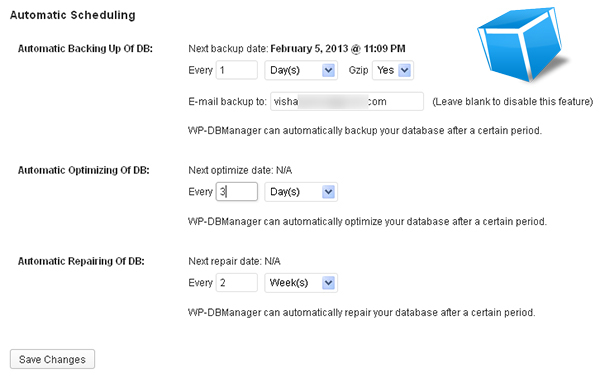 Click on “DB Options” and select the “Automatic Scheduling”. That’s all. Now you can set up the schedule as per your requirements depending upon your use of the site, how often do you publish new content, what is the importance of your published content, etc. and how much and what do you want to save. If you publish daily, it is advisable to take daily back-up or otherwise you can take weekly back-up of your published content. Don’t forget to add your email account detail to enable the plug-in to send the copy of your back-up! Having successfully installing and creating a scheduled automatic backup of all your important content, you can also create automatic back-up of all your important database files like the main WordPress folder, WordPress admin folder, WordPress includes folder, WordPress content folder, etc. Use any good FTP programs like SmartFTP to handle the task automatically which though is a paid program. But, it works fine for me and hence I recommend it to you as it comes with a great load of features except that it is not MAC compatible! So, that’s it! Schedule your FTP program for the automatic back-up according to your requirements as discussed above. Simply keep one simple thing in mind: save the WordPress content folder first as it is the most important file to back-up which includes almost everything that you value the most like your theme files, plug-in files and image and video uploads. And I am sure you don’t want to lose them! If you still find the details discussed here, you can contact any professional PHP Development India company for any further query who can best assist you with any of your doubts! Next: How to Know if a Website Uses WordPress?